It's not exactly big news that Sherlock Holmes is the most famous and recognised fictional detective in the world. Created by Scottish author and physician Sir Arthur Conan Doyle his exploits have intrigued and fascinated the world over and produced an extraordinary number of film and television adaptations, including that recent Guy Ritchie nonsense. Sorry, but we're big Conan Doyle fans here. Hugely popular on their home turf but rarely seen in the English speaking world are a series of Holmes films made by celebrated Russian director Igor Maslennikov, the best of which is his richly atmospheric adaptation of what is probably the most famous Holmes story of them all, Sherlock Holmes: The Hound of the Baskervilles (Priklyucheniya Sherloka Kholmsa i doktora Vatsona: Sobaka Baskerviley). With the sudden passing of Sir Charles Baskerville, his estate is instantly left in the care of his nephew Sir Henry (Nikita Mihalkov, director of Burnt by the Sun). In light of suspicious circumstances surrounding his uncle's death, detectives Sherlock Holmes (Vasili Livanov) and Dr. Watson (Vitali Solomin) are appointed to safeguard him. Holmes is exhorted by threatening letters to keep away, diverting the legendary detective. He follows leads in London while Watson accompanies Sir Henry to the Baskerville estate in Devonshire. Although tranquil in daytime, the countryside proves highly treacherous at night when the wind is drowned by the howling of an unseen beast. Maslennikov is renowned for his success of the drama Winter Cherries, which became so popular five years later a sequel was made, followed by a third. In 2000 Livanov and his co-star Vitali Solomin were voted the best impersonators of Sherlock Holmes and Doctor Watson in a poll by English press, and Livanov received an OBE for his portrayal of the Victorian sleuth in the much loved Russian TV series that has remained a perennial cult favourite for its wit, style and period detail. 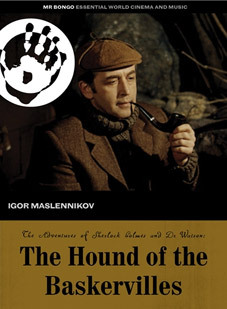 Sherlock Holmes: The Hound of the Baskervilles will be released on UK DVD for the first time ever on 21st May 2012 by Mr. Bongo Films at the RRP of £12.99. The press release makes no mention of extras, but a couple of stores suggest there might be an image gallery.